Attractive small bulbs with long lasting flowers are hard to come by, Eucomis vandermerwei is one that has all of these attributes. Very easy to grow in a container and easy care as well. 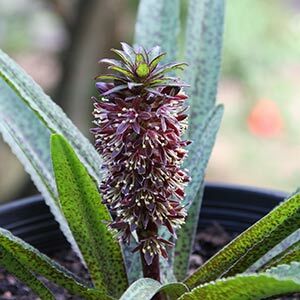 A smaller growing species, what Eucomis vandermerwei lacks in stature it certainly makes up for with attractive foliage and a delicately attractive flower. The foliage is a mid to deep green, with purple markings that add to the appearance. The flower is purple, small compared to some others, however very attractive and perfectly formed. For us this is a species that flowers in summer, the flower spike is a little ‘Pineapple’ shaped, however attractive. Excellent when grown in a container. It is winter dormant, however as spring comes around the foliage makes an appearance. Followed by the wonderful flower. Best in full morning sun, perhaps with a little afternoon shade in warmer areas. A well drained potting soil is essential, however extra water during summer and a liquid seaweed fertiliser every two weeks from spring will encourage strong growth. Bulbs should be planted with the tip of the bulb just below soil level in a free draining soil or potting mix. A dry winter is important as bulbs can rot in wet soils when dormant. Wait for foliage to appear before watering and fertilising. Use an all purpose slow release fertiliser in early spring. Follow up applications of a liquid seaweed fertiliser during active growth every 3 weeks. Over time it will form a clump over time and cam be divided in late winter to early spring. Division should be delayed until offsets are 2 -3 years old. It can also be propagated from seed, however this is difficult.